Ratnagiri is a beautiful district in Maharashtra that is situated between the Arabian Sea and Sahyadri Hills. Nestled in the lovely surroundings with hills, beaches, forests, rivers, hot water springs and water falls, it offers a complete package to the tourists. Ratnagiri is known for its exotic and delicious Alphonso mangoes. Another famous feature of Ratnagiri is its cuisine. The fish curry-rice combination and Solkadi offered here are unparalleled in taste. It is the birthplace of freedom fighters such as Lokamanya Balagangadhar Tilak and Veer Savarkar. Ratnagiri has a few imposing and splendid forts that were built during the period of Shivaji. Ratnagiri, at a distance of 335 km from Mumbai, offers a perfect weekend getaway from the mundane life of the city of Mumbai. Ratnagiri can get very hot in the summers, the temperatures peak at 40-42 degrees Celsius sometimes. Monsoons are enjoyable, but also bring with them insane levels of humidity, which makes the experience a sweaty and sulky one. Therefore, winters from November to February is the best time to visit Ratnagiri. By Rail: Ratnagiri has its own Railway station. There are about four trains plying every day from Mumbai to Ratnagiri. The average travel time is about 6 hours. By Road: There are three routes to reach Ratnagiri from Mumbai. Route 1: Mumbai - Navi Mumbai - Chiplun - Patansai - Ratnagiri; via NH 66. The travel time is about 7 hours and the distance covered is 347 km. Route 2: Mumbai - Lonavala - Khandala - Pimpri Chinchwad- Satara - Ratnagiri; via Bangalore-Mumbai Highway/Mumbai Highway/Mumbai-Pune Highway and NH 48. This takes an extra hour from the previous route, so the total time taken to reach is 8 hours and the distance is 446 km. Route 3: Mumbai - Lonavala - Pimpri Chinchwad - Chiplun - Patansai - Ratnagiri; via Bangalore-Mumbai Highway/Mumbai Highway/Mumbai-Pune Highway and NH 66. This takes 9 hours and takes the most time out of the three routes. The distance covered is 439 km. Since Route 2 has well-maintained roads, we recommend the second route to reach Ratnagiri from Mumbai. The journey takes a good 8 hours without pit-stops. Therefore, it is urged to start your journey as early as possible. Mumbai to Lonavala is 83 km in distance and takes 1 h 45 min to reach. Lonavala is a lovely hill station that was discovered by Lord Elphinstone in the year 1871. Tiger's Leap is a gorgeous cliff top that got its name due to its appearance like a tiger that leaps into the valley. It offers beauteous views of the Western Ghats. The drop height is 650 m, and the echo point at Tiger's Leap is a major attraction. Bushi Dam in Lonavala is a gorgeous sight to behold during the monsoons. It is built on River Indrayani. The steps of the dam overflow with water during the monsoons and people come in large numbers to enjoy this sight. Lonavala lake is a nice place to unwind. It is perfect to have a small picnic by the lake. Imagica Adlabs is an amusement theme park that is sure to attract kids. Lonavala is famous for chikki - a type of brittle that is traditionally made with peanuts and jaggery. However, these days, they have diversified into other options like dry fruit chikkis, flavoured chikkis, coconut chikkis, etc. Khandala is a hill station town that is an hour and 56 km away from Pimpri Chinchwad. Amrutanjan Point is a vantage point that provides excellent views of the valley. Duke's Nose is an extremely popular place for trekking and rappelling. This is a very challenging trek and must be undertaken only with ample guidance. Karla and Baja are historic Buddhist caves built in the Chaitya style of architecture. They are at a distance of 16 km from Khandala. Pimpri Chinchwad in Pune is at a distance of 53 km from Lonavala and takes an hour to reach. Pimpri Chinchwad is mostly an industrial hub. It is also famous for Morya Gosavi's shrine. This shrine gets submerged in water every year due to the flooding of the River Pavana. Nisargakavi Bahinabai Chaudhry Zoo is a snake park that is enjoyed by the young and old alike. Few other temples in Pimpri Chinchwad are ISKCON temple, Shri Mahavir Jain Temple, Bhakti Shakti, and Durga Tekdi. Next en route is Satara, which is at a distance of 177 km from Khandala. The time taken to reach is 3 hours. Satara is known for Kaas Plateau. It is a beautiful valley of flowers that is a part of the UNESCO World Heritage Site. There are more than 850 species of flowering plants in the Kaas Valley. Satara was first ruled by the Rashtrakutas, followed by Chalukyas and Mauryas, and then came in the Muslim invasion and finally the place was secured by the Maratha Empire. It has two gorgeous forts namely Ajinkyatara and Sajjangad. Both the forts hold a lot of importance in the history of the Marathas. provided a pivotal view of the entire South Maharashtra. Sajjangad was built by the Bahamani dynasty. A one of its kind statue of Chhatrapati Shivaji is established at Powai Naka in Satara. Ratnagiri is at a distance of 187 km from Satara and it takes 3 h 30 min to reach. It is a port city that is best known for its beaches, mangoes, culture and food. Located in the Southwestern part of Maharashtra, Ratnagiri is surrounded by the Sahyadri Hills on the East, and the Arabian Sea on the West. Here are the places that you can visit in Ratnagiri. This is a small village that houses the Swayambhu Ganapati Temple, which is dedicated to Lord Ganesha. Prachin Konkan is a museum that depicts the life of the earliest people in the Konkan area. Ganapatipule has some lovely beaches like Aare-Ware, Gaywadi beach, and Ganpatipule beaches. This fort is a major attraction near Ratnagiri. It is located at a distance of 14 km from Ganapatiphule. The fort stands on a cliff and overlooks the bay formed by Shastri river entering the Arabian Sea. There is a Ganpathi temple inside the fort that is a protected monument. The fort is almost in ruins, but the outer wall still stands tall and strong. This is a cave temple that is bound by the beautiful Sahyadris. Dedicated to Lord Shiva, Marleshwar Temple requires quite a bit of effort from the devotee to get a glimpse of the Lord. The 400 steps leading to the temple are quite a task to climb. Further up the temple are Dhareshwar Falls and Karamboli Doh. Maha Shivratri is celebrated with great reverence and in a grandiose manner in this temple. 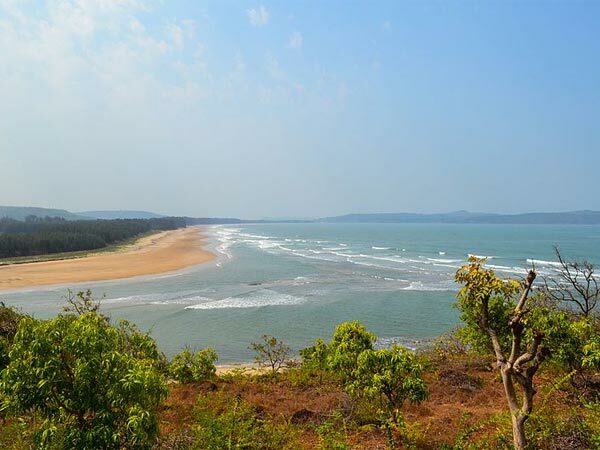 Anjarle is a serene white sand beach that is located in Ratnagiri. There are many adventure sports like parasailing, snorkelling and wind surfing available on the beach. Many shacks serve fresh and delicious seafood in their local style. The major attraction of Anjarle beach is Dolphin spotting. Kadyawarcha Ganpati Temple is close to the beach. The unique point of this temple is that the idol of Ganesha has a right-sided trunk, which is a rare sight. This palace was built in 1910 by the British for the king and queen of Burma/Myanmar who were sent to Ratnagiri in exile. Thibaw Palace was a royal prison for the first family of Burma, until they died in 1916. Situated atop a small hillock, this palace is now a museum maintained by the ASI. This fort built in the 16th century by the Bahamani kings later became the property of Adil Shahis. Several years later, the Maratha warrior Shivaji annexed it to his empire; after years of being under the control of the Muslims. The fort was later captured by the British from the Peshwas, who had captured it from the Marathas. This fort is in the shape of a horse-shoe, aka, ‘U' shaped. The fort is also called Ganpati Durga fort, as it has a temple of Goddess Durga and Ganpati inside the fort. This beach is perfect for a secluded getaway. The sea in Guhagar is shallow and the water currents are not very strong, making it favourable for swimming and indulging in water sports. It is a great sight to behold the setting sun from this beach. This beach has white sand too, making it very picturesque and beautiful. This beach is known exclusively for turtle-watch. A turtle festival is organised here every year in the month of January or February. Olive Ridley turtles migrate to the west coast of Maharashtra to lay eggs. Of these, almost 40% come to the Velas beach. Each female turtle lays around 90-150 eggs at a time. These eggs take about 55 days to hatch. However, it is interesting to note that only one out of the 1000 hatchlings reach adulthood. This museum, now maintained by the Archaeological Department, is the ancestral house of Lokamanya Balagangadhar Tilak. Tilak Ali museum depicts the life of Tilak and his contribution to the Indian freedom struggle in the form of paintings and photos. The museum exhibits the native Konkan architecture.